3 gold medallists from the Rio Olympics won in the Indonesia Masters semi-finals but Japan’s Matsutomo/Takahashi had to do it with a partisan crowd against them. The first match in the semi-final round was the only one that pitted Olympic gold medallists against both a tough challenger and an Istora Senayan full of partisan Indonesian fans. The shouting was deafening as the crowd supported Greysia Polii / Apriyani Rahayu against Japan’s world #2 Misaki Matsutomo / Ayaka Takahashi (pictured right). Greysia Polii and Apriyani Rahayu (pictured below) were keen to reach their second straight final after last week’s Malaysia Masters and they were leading throughout most of the first game. There were plenty of long rallies but Matsutomo and Takahashi, then, kept trying their best performance to reach every single point. “We were behind in the score at first, but we never think about the scores during a match since we have often faced this situation, even at the Olympics, so we are used to overcoming it,” said Matsutomo after the match. And sure enough, it was the Japanese pair who came away with the first game by the tight score of 22-20. Polii/Rahayu then upped their game. The score remained tight in the second game but the spectators kept volume high and pushed the Indonesian shuttlers to grab the points they needed to win their own 22-20 and force a decider. “After the break in third game, the wind became a factor for our performance. Some shuttlecocks flew high and it was easier for us to attack our opponents,” added Matsutomo, after the Japanese pair had run away with the deciding game 21-12. 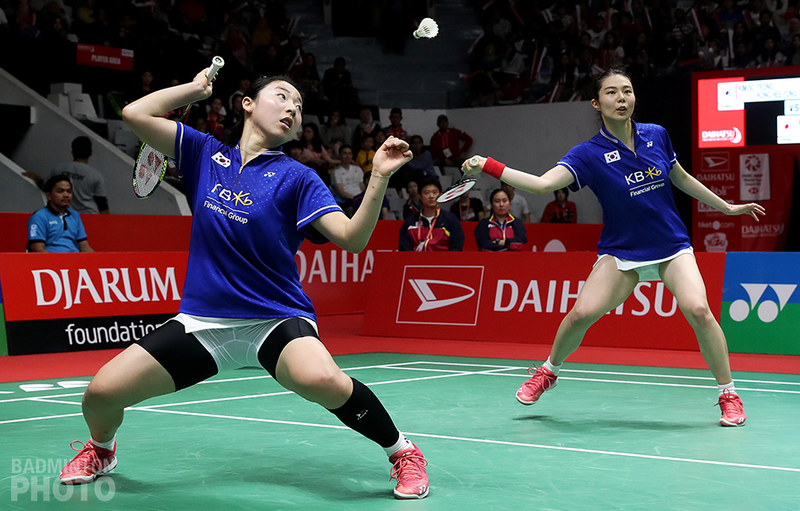 The second-seeded women’s doubles pair will now meet Korean pair, Kim So Yeong and Kong Hee Yong (pictured right), who successfully beat World Champions Matsumoto/Nagahara in three games. The Koreans were first paired up in late 2016 but have had so many partnership changes that they have only entered about a dozen tournaments together in the last two years. “Our opponents for tomorrow played well today. As we know, they play fast and bravely, so we will anticipate it and implement strategy to give away the attack and let the pace follow their way of playing,” explained Matsutomo. She added that she will benefit from the lessons learned by their compatriots who lost in semi-final round. After that 80-minute women’s doubles marathon opened proceedings, the mixed doubles winners from Rio made a much shorter appearance on court on semi-finals day but it still wasn’t all easy for Olympic gold medallists Tontowi Ahmad and Liliyana Natsir. The score was tight in the first game of their semi-final against 6th-seeded Chan Peng Soon / Goh Liu Ying, which was, of course, a repeat of the Rio gold medal match and would determine whether it, or the final, would be the last of Liliyana Natsir’s career, as the four-time World Champion will be retiring after the Indonesia Masters. The Malaysians rallied to save the first game point and send the opener into extra points at 20-all. 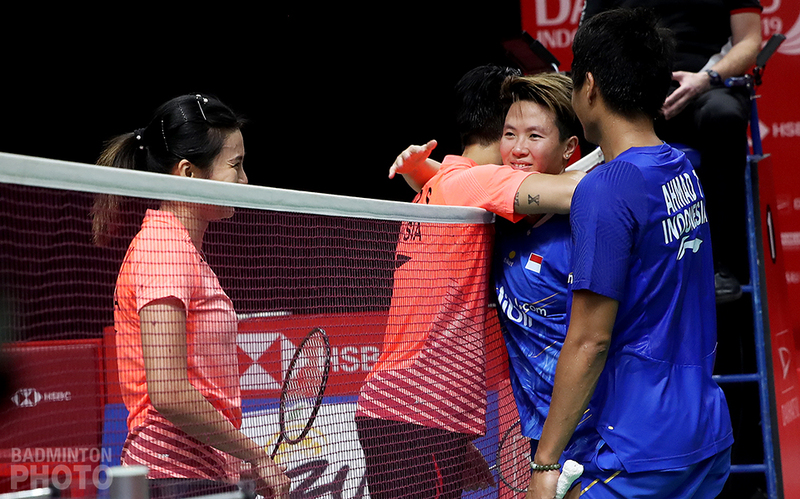 “The first game was tough for us, but at 20-20 we were really lucky to be supported by great spectators in the stadium, until we finally ended it 22-20,” explained Liliyana Natsir (pictured left) after the match. “We then implemented our strategy and techniques in the second game. It went well and put our opponents under pressure,” said the 34-year-old shuttler, after she and Ahmad ran away with the second game 21-11 to book a spot in the final. “I also wish her the best in her career outside of badminton, but one thing is even though this is the last for her, she did not allow us to win,” laughed Chan Peng Soon. 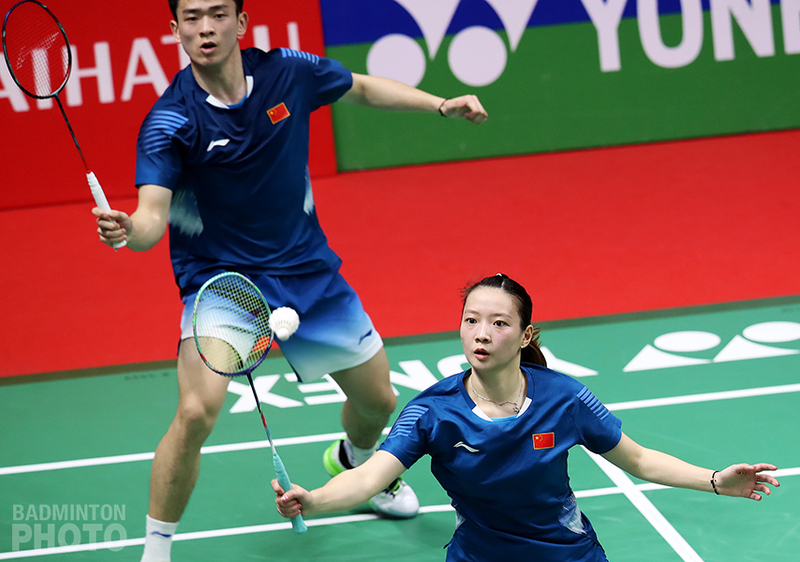 World Champions Zheng Siwei / Huang Yaqiong (pictured left) advanced to the final after beating Watanabe/Higashino in three games. It will be only the second time that Ahmad/Natsir will meet the world #1 in a final, the previous time being at the 2018 edition of this same event. “We will try our best, especially for me since tomorrow will be my last match,” Natsir said, adding that they will prepare by learning from their experience against Zheng/Huang, whom they have beaten only once in 4 meetings. Thirty minutes was all men’s singles world #1 Kento Momota (pictured right) needed to finish his semi-final against his World Champion predecessor Viktor Axelsen. 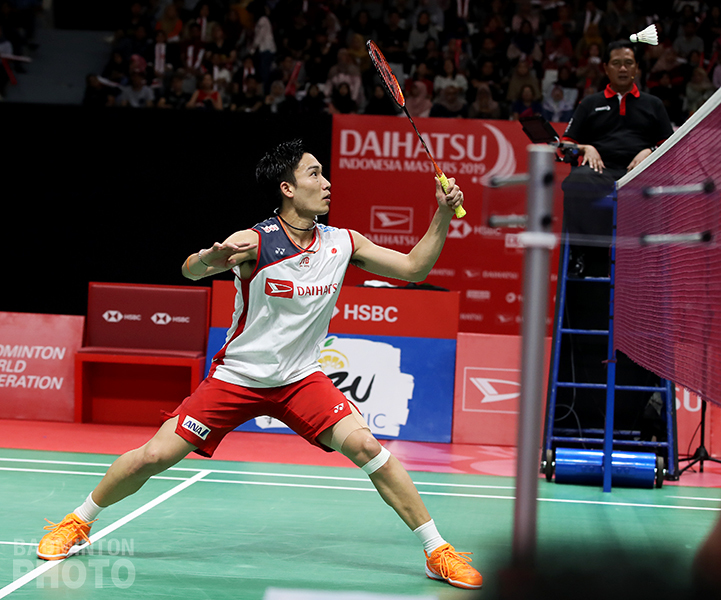 The Dane attacked well in the first game but Momota was still able to finish it 21-15. 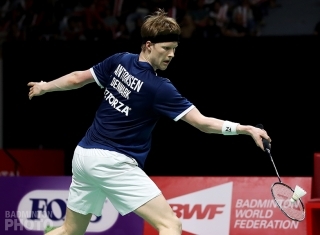 In the second game, Viktor Axelsen (pictured left) could not make his attacks count against Momota’s performance and the world #6 scored only 4 more points as the Japanese ace secured his place in the final. “Health – both physical and mental – are an all-in-one package that influenced this match, especially in the second game,” explained Axelsen, who finished runner-up to Momota at the Indonesia Open in this venue in 2018. Momota, on the other hand, thought he had some luck due to the wind factor: “It was not an easy match for me. 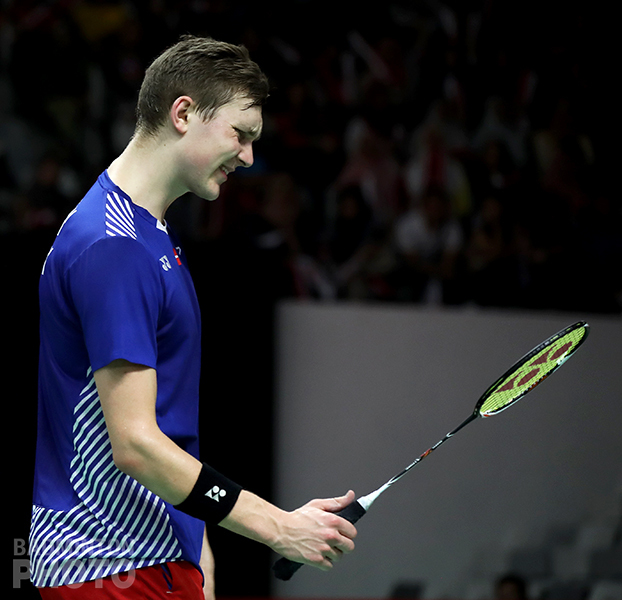 The second game brought many benefits for me since the wind was strong, so it was easy to smash on Axelsen get points that way,” Momota explained. Anders Antonsen (pictured right) had earlier earned his final ticket after beating Jonatan Christie in straight games and will be Momota’s opponent on Sunday. Momota thinks it will not be easy to beat Antonsen since the last time they had tight three-game match in the Korea Open.